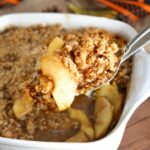 A new take on a traditional fall favorite, my Chai Spiced Apple Crisp combines gorgeous chai flavors with apples, topped with a decadent, crunchy and buttery topping. Add the apples to an 8x8 pan. Mix together the brown and white sugars with the flour and cinnamon. Sprinkle over apples and mix with your hands until apples are covered. Combine the oats flour, brown sugar, baking powder, and melted butter until roughly mixed. Sprinkle evenly over the apples. Crumble evenly over the apple mixture. Bake at 350 degrees F for 40-45 minutes, the apples will be tender and the top crispy and brown. Slice the apples in even slices, so they bake evenly. Not TOO thin! Let the baked dish rest for at least 10 minutes after you take it out of the oven. It allows the sauce a chance to thicken up. If you find that your oven runs hot, or the crisp is starting to burn, cover the dish with foil until the apples are tender. Make this ahead - toss the apples with a little lemon before adding the sugar/flour/cinnamon. This will prevent the apples from browning. Don't add the topping until ready to bake.